So today I took my firm starter from last night, let it warm up on the counter for an hour, then mixed it with 4-1/2 cups bread flour, 2-1/2 teaspoons salt, and somewhere between a cup and a cup and a half of water. 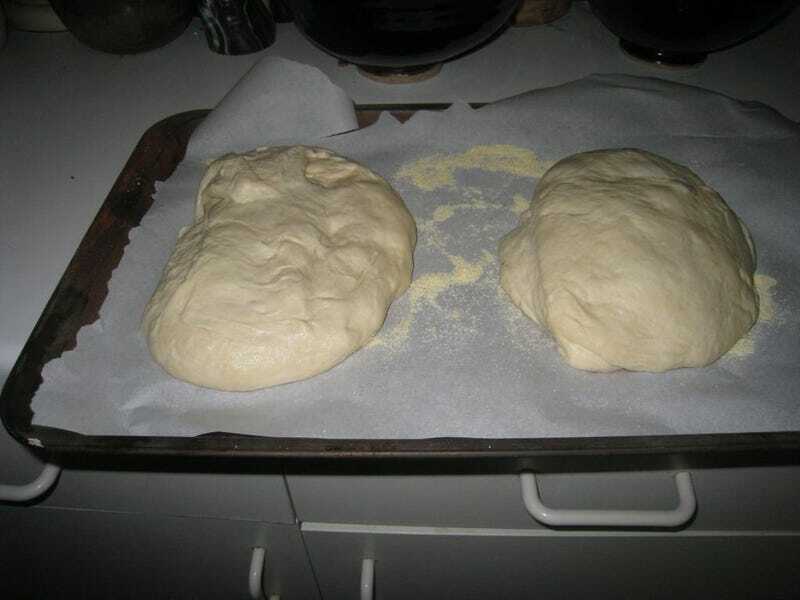 Then I kneaded that puppy for about ten minutes until it was nice and smooth, and set it in a lightly-oiled bowl to let those wild yeasties do their magic. After about four hours the blob was doubled in size, and I cut it in half to proof overnight in the fridge. When I cut it there was this lovely sour smell that came out, and I pranced over to missus chritter, pan in hand and said SMELL THIS! She took a whiff. "Sour." And thus I am validated. So tomorrow I'll take them out of the fridge and let them warm up for four hours or so before baking. My plan is to pour one half into my Dutch oven and bake a large loaf partially covered, and to use the other half to try to make two surface-tension boules, the Peter Reinhart way. Wish me luck! Happy baking, Groupthink!